Rest assured Star Trek fans, Paramount’s new game linking the 2009 reboot film to this year’s “Star Trek Into Darkness,” looks to be a winner, based on our recent walkthrough. The game does not officially hit stores until April 23, less than a month before the new film’s hotly anticipated release. But we were able to preview most of the game’s levels and received an in-depth explanation of the game’s original, and canonical, storyline. “We wanted to break the trend of movie based games,” Paramount’s Brian Miller told Yahoo News during an extensive preview of the still unfinished game. Usually, when a company like Paramount wants to make a video game based on one of their film properties, they contract the work out to an outside studio. And over the years, the results have been decidedly mixed. In this case, they decided to go the exact opposite route. “In order to do it the right way we had to do it ourselves,” Miller said, acknowledging the endeavor is a bigger risk for the studio but also offers the potential for higher reward. The third-person shooter finds gamers in control of Captain Kirk and Commander Spock and picks up the story shortly after the last film. Diehard Trek fans will quickly notice subtle ways in which the characters have evolved since we last saw them on screen. For example, actor Chris Pine, who reprises his role as Kirk for the game, speaks and behaves more as the in-command captain of the classic 1960’s television series and less like the punky upstart we met in the 2009 reboot. And for anyone concerned that a new Star Trek game would be just be another mindless, shoot-em-up, there are several pleasant layers to the game that should please more cerebral gamers. For example, the tricorder plays a significant role in the game, allowing players to thoroughly investigate their environments in a technique that evokes Batman’s “detective mode” in the popular “Arkham” series. Although graphics were still being completed, we did see some finished cinematic cut scenes from the game and they looked solid. As to other details of the game itself, Paramount says “Star Trek” will be offered across multiple platforms, including Xbox 360, Playstation 3 and PC. It will feature online co-op play and 3D functionality but Paramount decided against hands free functionality using Microsoft’s Kinect or Sony’s Move. One of the most interesting aspects of the game – and one that is sure to give its 15 hour storyline strong replay value – is that Kirk and Spock experience events in the game through their own personal points of view. Those experiential differences affect the larger aspects of the game including combat techniques and approaches to problem solving. During away missions, Kirk can call in an airstrike from the Enterprise, while Spock is able to deploy his famous Vulcan pinch move. The unique perspectives also carry down to how other, non-player controlled characters interact with the player. Yes, that means the same female alien character hanging out in the Enterprise hallways will flirt with Kirk but largely ignore Spock. We were also shown some levels of the game that breakout from the traditional shooter role. There are two levels that allow players to experience the thrill of skydiving in scenes reminiscent of the great drill platform scene from the 2009 film. And yes, there are sequences where the player takes direct control of the Enterprise. In co-op mode, one player fires the ship’s lasers while the other is in charge of deploying the photon torpedoes. 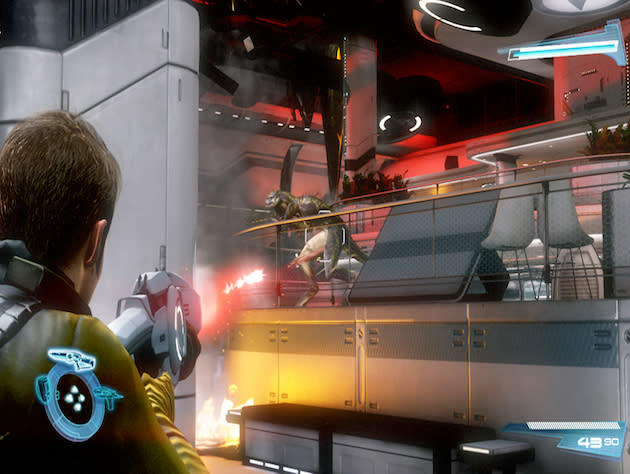 In one of the most entertaining levels we saw, the game’s developers merged two famous episodes from the original series, during which Kirk and Spock are forced to battle each other to the amusement of their new enemy. “When you've been playing a game with a buddy for a few hours you're going to welcome the opportunity to punch him,” Miller said. Star Trek has its share of classic villains: Klingons, the Borg, Khan and so on. But with J.J. Abrams keeping the “Star Trek Into Darkness” villain under an airtight veil of secrecy, many fans have looked to the game for clues. On this front, there’s good news and bad news. The good news is that a beloved villain is being brought back into the fold: the Gorn. The bad news, at least for impatient fans, is that the game won’t be giving away too many secrets about the upcoming film. Story has been the central focus for Paramount over the past three years as they developed the game. They worked closely with the creative team from the Star Trek films – including bringing back the principal cast to reprise their roles in the game. They even brought in Academy Award winning composer, and frequent Abrams collaborator, Michael Giacchino and his 100-piece orchestra to create an original score for the game. “We were throwing everything at it,” Miller said. As the game opens, the U.S.S. Enterprise is sent to investigate a space station under duress. The station has been tasked with research on the New Vulcan colony project, developing a new home world for Spock’s species, whose home planet was destroyed in the last film. But as Kirk and Spock explore the station, they learn something has gone very wrong. The Starfleeet commander in charge of the station has attempted to exploit a risky new technology that has ripped open a wormhole in space, which serves as a doorway for the invading Gorn, a violent and imperial species first seen in the 1967 episode “Arena” from the original Trek TV series. The “Arena” episode is one of the most beloved of the original series. So, the Paramount team was careful about updating a classic villain. However, the Gorn is nearly as well known for the dated rubber costume worn by actor Bobby Clark. Miller and his team set out to update the Gorn, creating no less than 15 different species of Gorn, including brute fighters, cunning team leaders and even a female Gorn that leaps off of walls to attack unsuspecting players. When Spock performs a mind meld on one of the captured Gorn we also learn some fun and exciting details about their backstory as a merciless race of marauders that have conquered their own galaxy through endless war. During that mind meld sequence the player controlling Spock is forced to take part in the Gorn’s hostile actions, including the cold-blooded murder of the Vulcan commander aboard the space station; a man who served as Spock’s mentor. “We want you to feel like you just watched a Star Trek film,” Miller said. Over the years, each new gaming platform has offered leaps forward in graphics, sound and scope. But the fundamental aspects of storytelling have largely remained relegated to the backburner. As Tom Bissell writes in his excellent book “Extra Lives,” the fundamental game playing experience is often directly at odds with classic narrative. In Star Trek parlance, there has been no shortage of “red shirt” efforts in the history of gaming. In theory, an adaptation of existing characters like those in like Star Trek can overcome some of these challenges. After all, almost anyone picking up the game is already likely to know something about Kirk and Spock. But examining the legacy of movie-to-game adaptations is often akin to wading through a junkyard of failed endeavors. “Avatar” is the most successful film in history but do you know anyone who raves about the game that sets up the events leading into the film? And while we’ve had a pair of excellent Batman games in recent years, they are not directly connected to Christopher Nolan’s trilogy of films. While more successful game adaptations, including “The Walking Dead” and “Back to the Future” installments from Telltale Games have succeeded by dropping players into a non-traditional format that is often more like reading an interactive graphic novel than an arcade experience. What Paramount has attempted to do is build on the rebooted characters introduced in the 2009 film within the game’s original story but also through the gameplay itself. “In my opinion game developers are still struggling with story. Trek was never just running around and shooting people,” Miller said. To help craft their story, Paramount recruited God of War writer Marianne Krawczyk. Making the challenge even greater, they had to work around the notorious “mystery box” culture cultivated by Abrams. When the game team came up with ideas for their story, they would await permission from the director’s camp. The Paramount team is clearly a little nervous about the launch of their signature game, a stance that is unusual and honestly a little endearing coming from such a large corporate entity. But they were also very forthcoming about their efforts to make this not just a game, but also a story, that Star Trek fans can embrace.